A hallmark of traditional Italian cuisine, even the simplest of seafood pastas carries with it an air of refinement. From spaghetti dishes with tomato and chilli to rich, creamy ravioli this collection of seafood pasta recipes has contains some great inspiration for simple suppers and impressive dinner party dishes alike. As with all seafood dishes for best results take care to use only the very freshest ingredients. 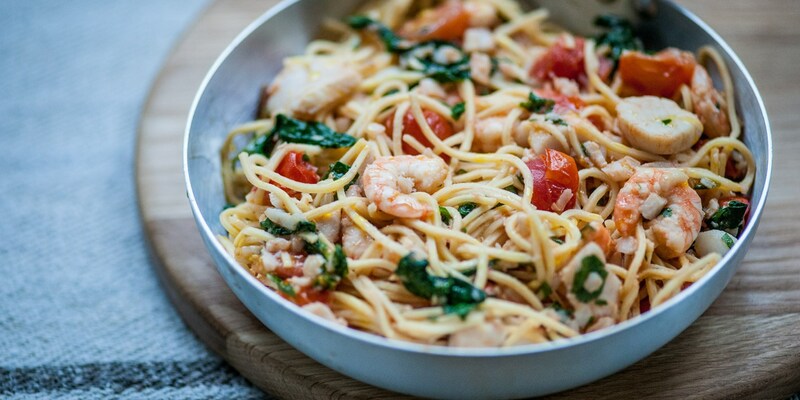 Nathan Outlaw's Seafood spaghetti recipe combines fat king prawns with juicy cod and scallops, making a fantastic easy pasta dinner. If you're looking for a seafood pasta dish to really impress your guests try Dominic Chapman's Crab ravioli, a crab and salmon pasta recipe made with fresh pasta. Shaun Rankin's Linguine with mussels is enhanced with the addition of salty chorizo, or for a truly stunning pasta recipe bursting with colour and flavour try Luke Holder's Brill, English peas and farfalle.